What do you get when you combine a boom in health care needs with historically low unemployment in the middle of an economically growing region? It’s not a trick question. It’s the challenge Parkview Health is facing as northeast Indiana’s largest employer—and it’s a good problem to have. 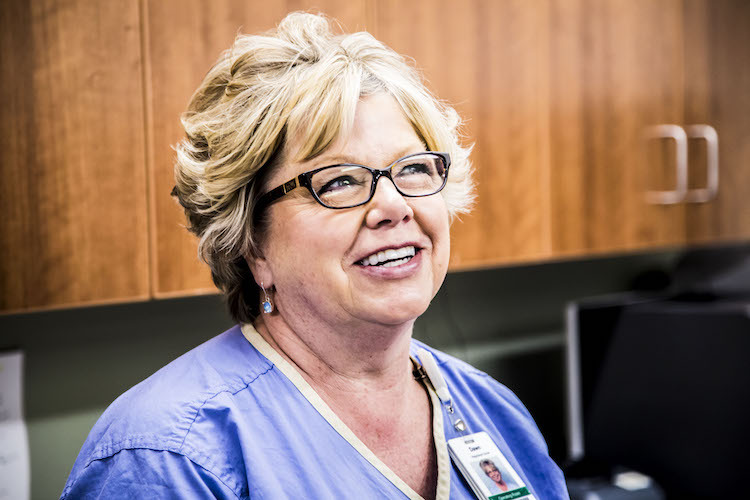 With more and more patients choosing Parkview, the health system has grown to include more than 12,000 co-workers (and counting). Jeff Rice, Manager of Talent Acquisition and Student Services, says that while the need for new co-workers is constant, the types of roles needed can fluctuate. 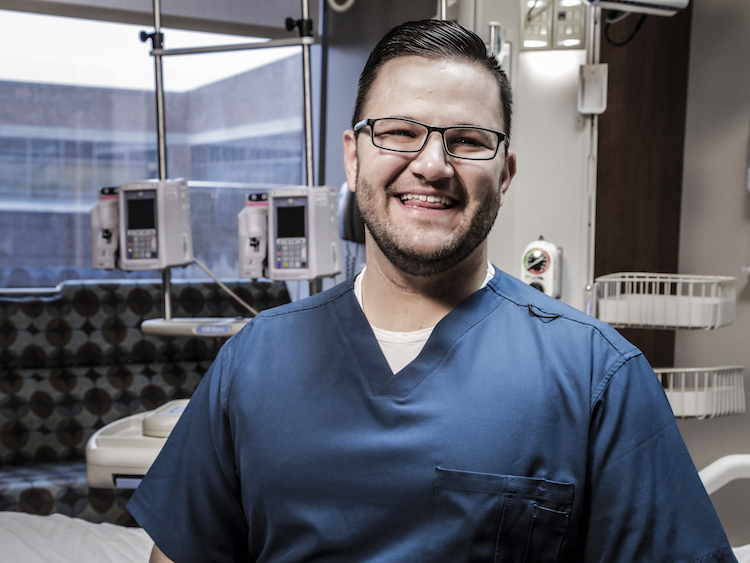 Shane Mataraza is a Nurse Leader in the surgical ICU at Parkview Regional Medical Center. The demand for nurses isn’t unique to Parkview. According to the U.S. Bureau of Labor Statistics, employment of registered nurses is projected to grow 15 percent from 2016 to 2026—much faster than the average for all occupations. This growth stems from a number of factors, including an increase in chronic conditions, like diabetes and obesity, and increased demand for healthcare services from the baby-boom generation. Parkview’s greatest need is for hospital bedside nurses, which make up 20 percent of the system’s job postings. That doesn’t include other types of nursing positions, leadership roles, or positions within Parkview Physicians Group. Rice notes that Parkview’s culture alone often serves to attract RNs looking for career opportunities. If you’re looking for a way to break into the healthcare industry, surgical technology might be a great place to start. “Surg techs,” as they’re often called, are required to have an associate degree or certification, which may not require as much time as a nursing degree. However, the position is still challenging and rewarding, explains Marcy Rogers, VP of Parkview’s surgical services. Rogers also references Parkview’s culture as a reason qualified candidates choose to work with Parkview. “Our culture provides for inclusivity, a positive work environment, support from leadership, and the ability to speak up if there are concerns,” she explains. Dawn Rosbrugh, a RN, works in the operating room at Parkview Regional Medical Center. Because technology can be a broad category, David Winn, Vice President of Information Services and Support, describes the most in-demand roles within his area. Application analysts build, test, and maintain applications. Information security technology and provisioning/access analysts form the data and network security infrastructure. Desktop/help desk services staff provide daily, 24-hour service and support. And service line coordination specialists act as liaisons between information services and other parts of the organization. Winn emphasizes that technology job candidates often don’t need healthcare experience to work for Parkview. “We have a strong interest in the recruitment of qualified and skilled talent from industries other than healthcare in order to infuse innovative concepts and ideas with classic healthcare best practices and techniques,” he says. For more information about working at Parkview, visit the Careers page on their website. For registered nurses, getting a job could be as easy as walking into the hospital. Starting in May, Parkview Hospital Randallia will host open interviews specifically for RN positions. Candidates will meet with a hiring leader and potentially leave with a contingent job offer. For more information, email nursing@parkview.com or call 260-266-7263.